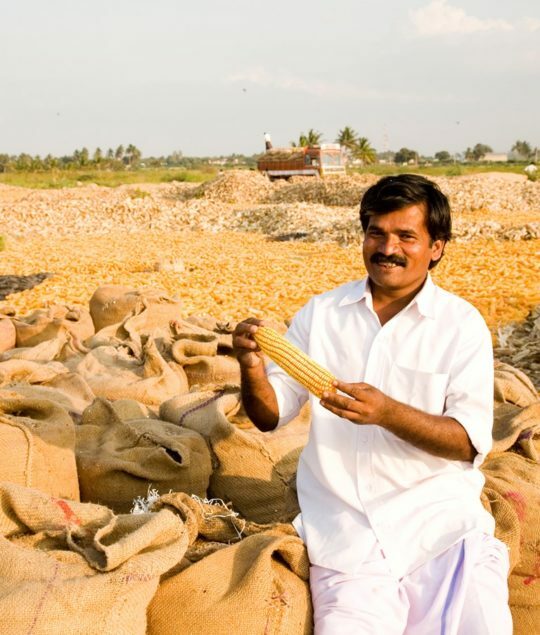 A farmer in India during corn harvest. Today, guest commentary from Krysta Harden, DuPont Vice President of Public Policy and Chief Sustainability Officer, has published a post on The Chicago Council on Global Affairs (CCGA), Global Food For Thought blog. Confronting Our Biggest Challenges: Innovation and Collaboration Will Drive Food Security, was submitted in advance of Harden’s participation on a panel in the upcoming 2017 Global Food Security Symposium hosted by the CCGA. Having served for most of my career in the public sector and now with one year of private sector experience at DuPont, I see now, more than ever, the importance of public-private partnerships. I firmly believe we can leverage the leadership and innovation that a company like DuPont wields to establish a responsive and sustainable agriculture industry that helps address our food security challenges. Integrated and holistic: land use, water and energy efficiency, ecosystems and biodiversity are all interrelated and need to be considered holistically in developing solutions. Focused on local impact: solutions must support local communities, enhance livelihoods and assure social and economic value to those connected to the food system. Collaborative: food and agriculture is a system, so we need to take a value network approach. Collaboration among all stakeholders, big and small, is essential if we are to bring sustainable, scalable solutions to the market. Innovative: product, technical, process, and business model innovations will all be required to realize a more sustainable food and agriculture system. Together, these principles will help us create a more sustainable approach to food production. Innovation is a requirement for us. We must help lead the way.